Architecture does something to set the mood. The way a building is put together shows the human spirit where to turn, how to feel and maybe even what to do next. Ancients knew how to bring together the soul’s longing to sense the presence of God and the building that brought people together for corporate worship. Here in Houston there is a special place to experience this. It is out at the Lanier Theological Library. 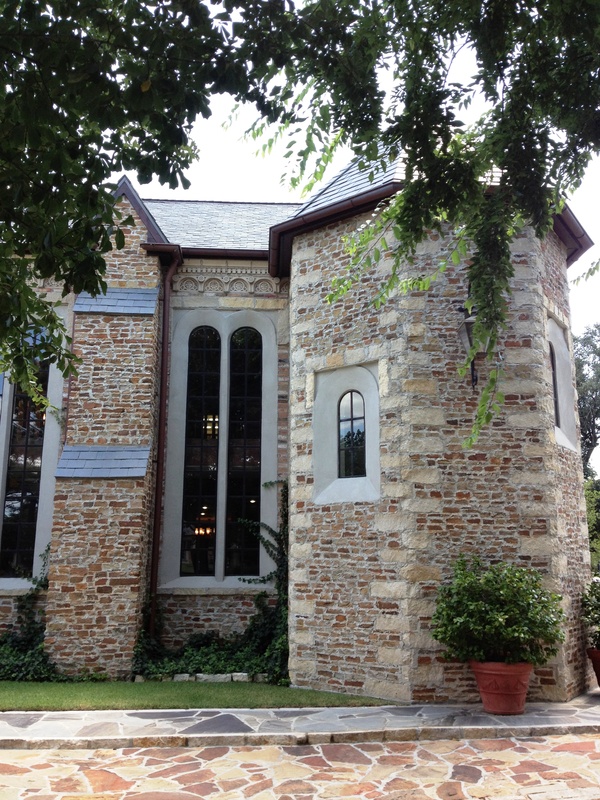 Along with the amazing collection and remarkable building where it is housed, a chapel has been built. It is a reproduction of a Byzantine Chapel. It was a wonderful reminder to me of days gone-by in the hills of Scotland. There we had visited many castles, stately homes and of course amazing church buildings. The acoustics alone brought your spirit into a moment of repose and quietness. The skillful construction made you feel small, lowly in the presence of something much bigger than you. God’s greatness and power are sustained in the mood of such a structure. 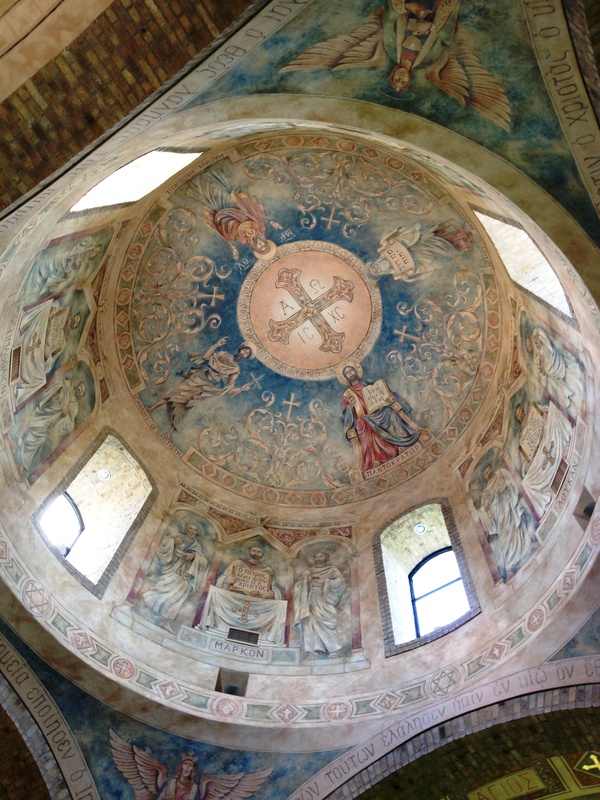 My eyes quickly lifted up and took in the grandeur of the painted domed ceiling. Artwork blended with architecture was a masterpiece. It is a testimony to man’s creative hand. When I spoke softly, my words reverberated throughout the chamber. I almost felt apologetic of speaking out of turn. An ambiance of worship, respect and awe were easily felt here. Once in a while it is good to be quiet before the LORD. This is not the only kind of worship that there is. Lively, spontaneous and energetic fits for so many of us. But, there are times to listen for what can be heard in quietness that has great value too. Take a moment. In your loud, busy and cacaphony of life, shut the volume and listen. God does speak through the thunder but also through the still small voice. We can try changing our location. Find a place that shuts out the noise and hear what God says. It might be the same message but in its varied approach, it could be reenforced to find a more permanent place for our spirit. Bless you in your quiet moments of your very full lives. There was a combination of explosions, gun fire, collisions, fight scenes, mayhem and more. 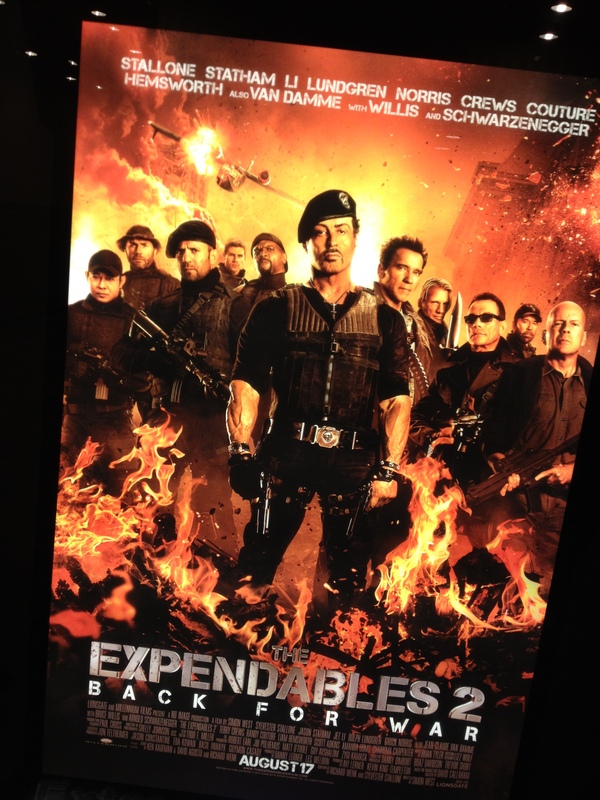 Expendables 2 was not a disappointment. Rather it was a fulfillment. If you want an action show with some funny lines, then this is your “fix”. I grew up with these action stars. Now that they are in their golden years, they still have it and can kick the proverbial hind end of the bad guys. High tech wasn’t as important as the muscle man making a mad dash with his back covered by his buddies. Camaraderie was key and there was only one lone wolf on the good side. Even he left his isolation and joined the pack. Bulging biceps, powerful pectorals and glowing glutes were the stunts of these mega stars. Each time they rescued whoever needed to be rescued. They buried the bad guys along the way. Revenge even came into play. Ok, it was justice served. I’ll go with that. If you get a chance to watch this exhilarating movie try it in the theater that has extra sensory experience. The walls vibrated and the chairs moved with the g-force of explosions. At least it felt that way. When ruthless evil forces waste human life for their own financial gain, it’s time for the expendable mercenaries to wreak havoc on them. While saving the world from weapons grade plutonium falling into the hands of the wrong people, the bad guys get their justice served to them with extreme bravado. Yeah, I’m a Rocky Rambo enthusiast. Martial arts films have frequented my entertainment list. Action movies are usually my fallback selection when looking for a DVD to fill up a vacant spot on my schedule. Guys like me have wrestled on the mat, smiled in the field when the scent of freshly fired gunpowder has punched a perfectly placed hole in the middle of a target, raised an eyebrow of satisfaction when an arrow has pierced the bull’s eye of a target 45 yards away or used firecrackers to blow up an imaginary enemy missile site deep in the territory of the enemy. There is a longing for a release of pent-up energy in a fast paced adventure like this. There was even a plot to this film and a touching ending that made perfect sense from the heart of guys who believe in honor, brotherhood and courage. Yup, go see it if you need an adventure. How many days does it take to become an official Texan? That question was in the background of our busy days getting settled in our new state. Our move from California to the land of longhorn cattle, big oil and vast landscapes is keeping our daily schedule filled to the brim. 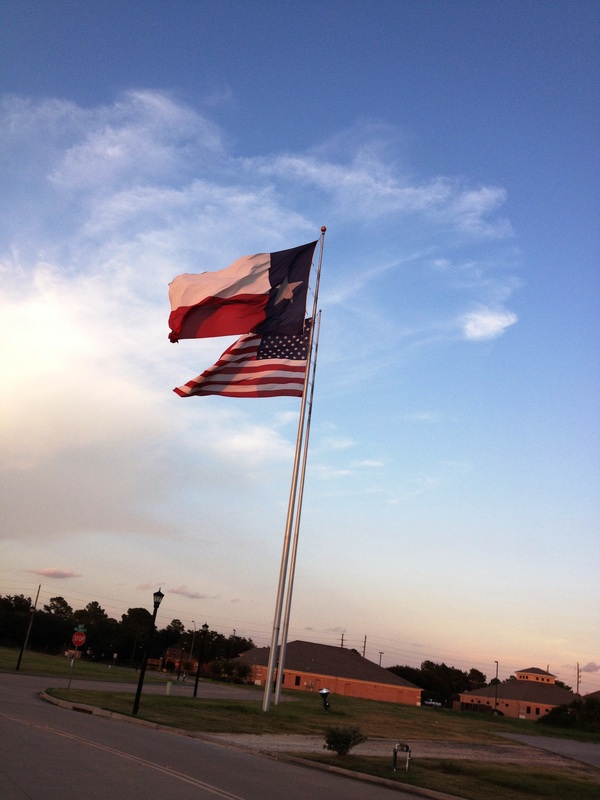 One of the many to-do items for us is obtaining our Texas driver’s licences. Like many states we have a small window of time to take care of these matters. A 30-90 day window is about all any state gives someone to become legal residents once you move across state lines. I studied the information online. With a large measure of confidence my bride and I drove to the correct bureau to take care of this matter. We stood in a long line and were dutifully informed that I needed to do a lot more than what we were prepared for that morning. The public employee was cheerful and helpful. That helped a lot since we had invested that day to take care of these official matters. She gave us a hard copy of things that we needed to do before being granted our Texas drivers licenses. Back at home I studied the sheet, revisited the website and made my lists and scheduled appointments on my calendar. This was going to require three more days at a minimum. There was no other alternative. First, I had to take our vehicles into a certified state inspection station. Vehicle inspections are advertised on the windshield of every car and truck on Texas roads. Motorcycles have these stickers on a special panel attached to the rear license plate. This episode alone took four trips to two different inspection stations. All of my vehicles passed! My motorcycle took two trips since the first station didn’t have the stickers or the plate to attach the sticker once the inspection was done. With safety inspection papers in hand we stopped in at the County Tax Assessor’s Office. This took two trips since I had forgotten some papers…groan. Providentially, I ended up at an auxiliary office that had a very short line. Then, on our fourth day we drove one hour out-of-town to small driver’s license bureau. There the wait was only 30 minutes and the processing was a mere 20 minutes total. We had all of the right documents! We walked out of the state office with our driver’s licenses. Now, we are both official Texans. Yehaw! Have you had one of those moments when you were just caught short? Something froze you in time. It was unexpected, totally surprising or shockingly arresting? There on the floor in our hallway was a very large cockroach. It was Texas-sized. Why does this bug conjure up the very epitome of ugly to the human mind? Their color, their appendages, their movement, their reputation all add up to “Yuck!” There could not have possibly been cockroaches on earth before original sin. Or maybe as a result of the Fall, something else very good and beautiful morphed into these hideous creatures. I grabbed a can of insecticide. 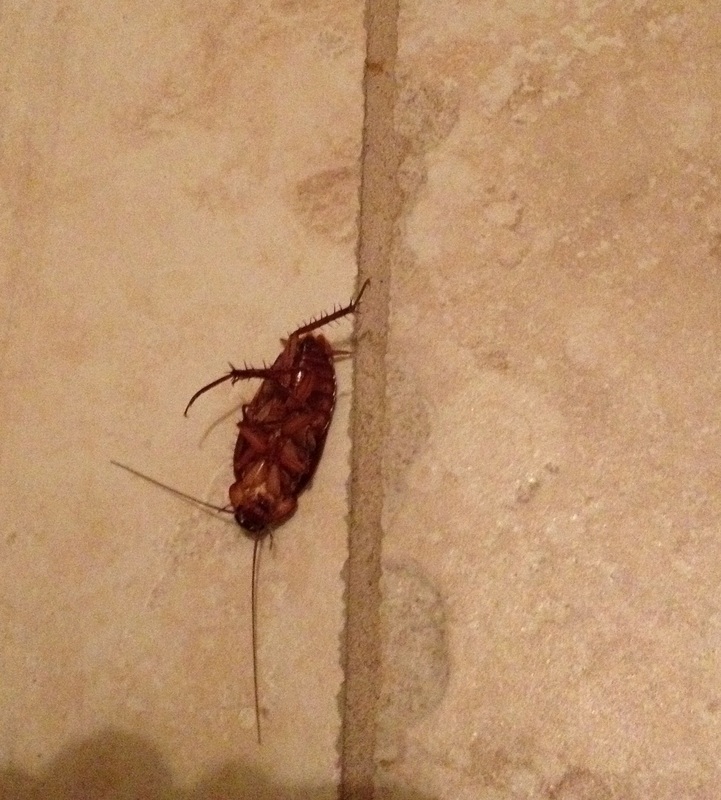 According to the can, this lethal anti-bug poison was specifically formulated to kill roaches on contact. The first volley of kill-juice was a direct hit. This insect fluttered, kicked up its legs and gyrate like a dancing machine. This bug did not stop but kept on moving more. It’s like it was irritated but it was more invigorated than ever. At first I thought that this must be a super bug. So, I sprayed this intruder for a second time. Again, it seemed to excite the critter. I was kicking its legs, wagging its antennae and fluttering its wings. Surely, this was its last gasp for life, its death dance. I left it to die on its own. My morning moved along at a nice brisk pace. Later, I came back to see if this visitor from the lower regions had finally expired. It had not! Annoyed, I gave it a good dose from the same insecticide. This was its third application. Again this goofy stubborn infectious monster kicked to life again. That was it. I had to begin my day. Appointments waited for me in the human world where I live. I grabbed a broom and bonked this guy on its vital parts. One swift conk did the trick. Now, it was a dustpan and a trip outside to deposit its carcass into the garbage can. Even a super bug was no match for a broom beating. I hope that it was loud enough of a commotion to warn all of his buddies that they are not welcome in my house. Just call me the broom basher of the super bugs. Planning for this welcoming day of new student orientation was a big deal. Everyone on our staff was focused on this gathering. Leading up to this event each of our staff and many of our faculty had their individual responsibilities. In the conversations preceding this day, I could tell that there was a building excitement among our team. All of the preparations were being handled well. We double-checked all of our responsibilities and everything was as it should be. I like looking into the eyes of our staff and seeing a brightness that can never be answered by human terms. This deep satisfaction in our duties and the joy of anticipation are elements of an es spirit de corps that must be treasured when it appears simply because we don’t always know how to generate it again. The night before our new seminary students arrived on campus for their orientation, I had a nervous night’s fitful sleep. I tossed and turned. Each part of my roles I rehearsed in my head. My alarm clock did its job but was unnecessary. I was waiting for it to ring just so that I could finally turn it off and get my day started. Do you remember being that eager from something? When I arrived on campus, the parking lot was already getting full. 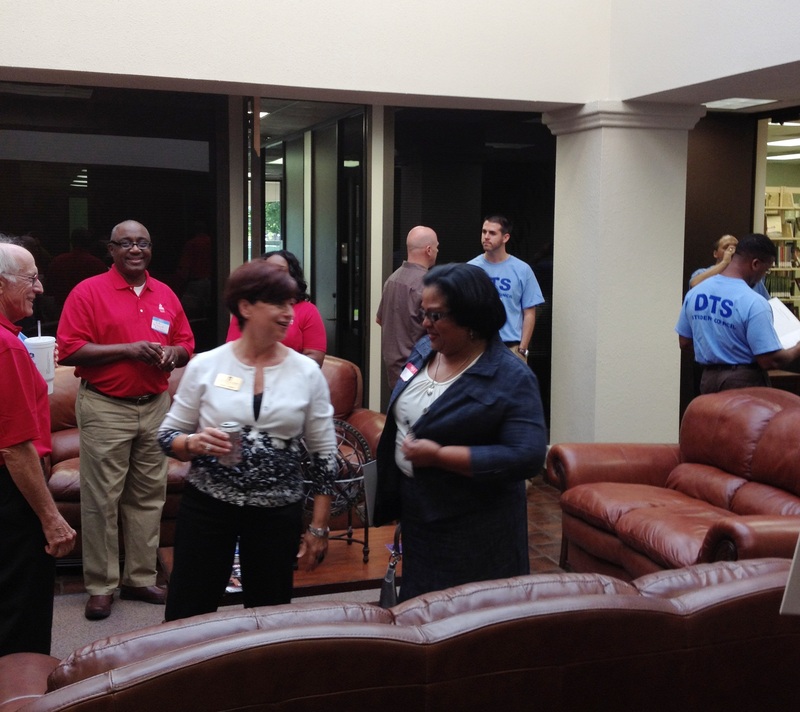 The foyer of our campus was buzzing with activity. I could feel the excitement. 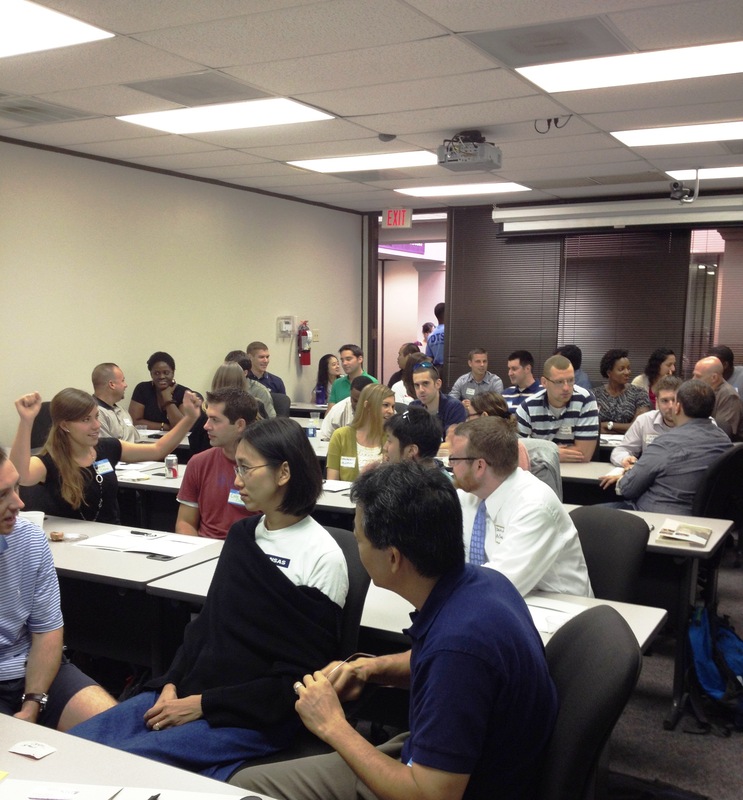 Besides New Student Orientation we had three classes in session. Our tiny facility has only three classrooms. If you add Orientation and 3 classrooms you probably assessed that we had space issues. Our neighboring College of Biblical Studies graciously opened up a classroom for our use. Still professors, students and administrators were scurrying around making sure that they were heading in the right direction. Oh, did I mention that one of the three classes was being taught in Mandarin and those students were seeking directions but the multi-linguists were in short supply? What I will always remember about this day are the lives of our new students. Their stories of why they came and how they came moved me deeply. God has left His indelible mark of grace in each of their lives and given us the privilege to be a part of fulfilling their calling to serve the Almighty. For most of my adult life I have involved with theology in one way or another. A good portion of my professional career I have been immersed in theological higher education. That kind of pursuit necessitates a specialized interest in reading, lot of reading. This endeavor of course requires that I have a lot of books close at hand. Or if necessary at least in the realm of geographical proximity. That means wherever I am, I seek out collections where scholarly volumes can be a part of my research and study. 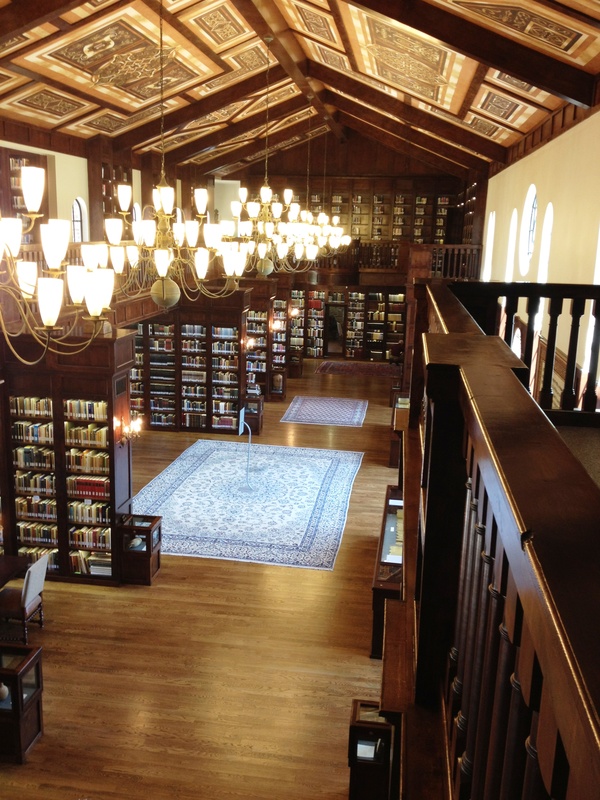 Here in Houston there is a collection, a library that is remarkable. Besides the books that now count up into the tens of thousands, the building that houses this collection is even more startling. Furthermore, the collection is open to the public at no charge. It was a very hot day when my colleagues and I made a trek to visit this depository of learning. The proprietor had a building constructed that is in the Cambridge Oxford style. Two-feet thick stone walls is the basic construction. Inside the woodwork is exquisite, the craftsmanship represents the finest skills in that trade. Artwork decks the ceiling. Ornate tapestries tastefully add to the grandeur of the facility. Museum quality pieces are housed in protected displays. Some are replicas, like the Dead Sea Scrolls. Others are authentic; I marvelled at the first edition first copy of the 1611 King James Bible. 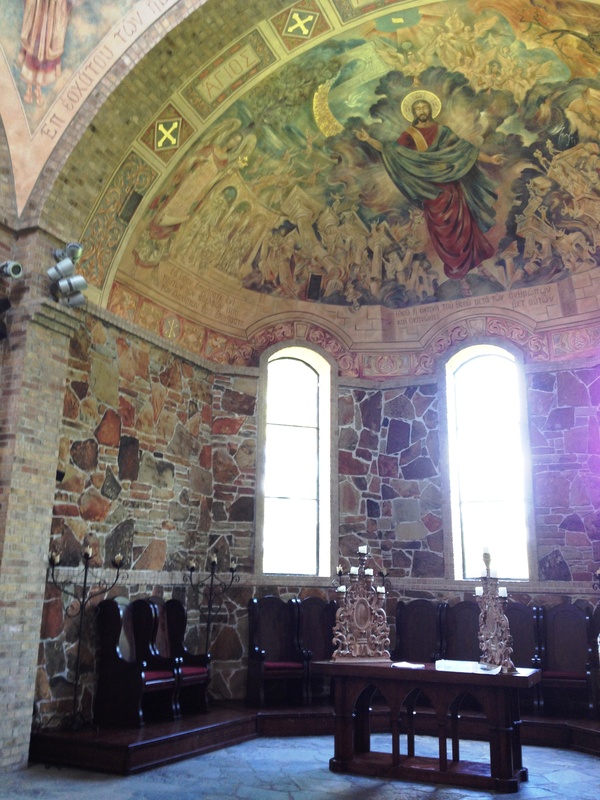 The Chapel was gorgeous. It is a replica of a Byzantine era structure. There is an atmosphere inside that building that is inspiring. Not everyone will want to visit a place like this. You have to be associated with theological research to have that interest. 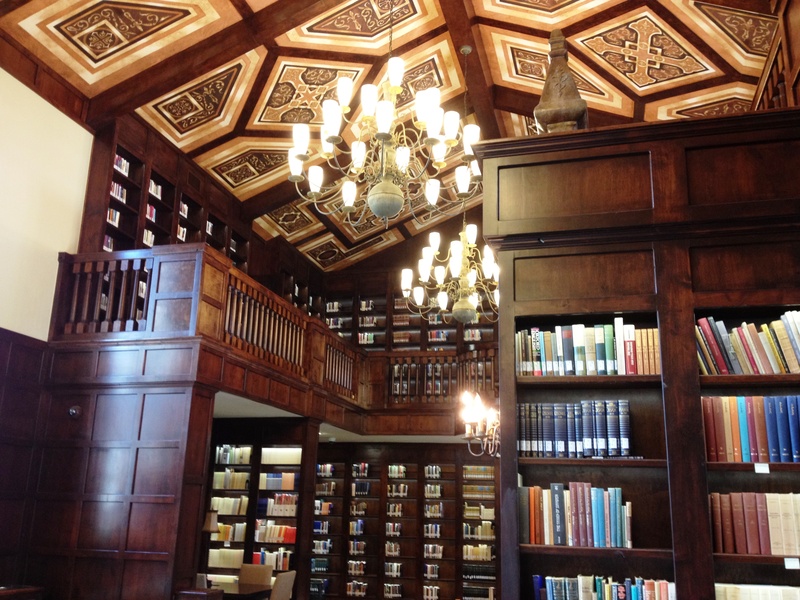 But, if you do, this Lanier Theological Library is a great destination. Our adventure took us into a local discount store. There are treasures to be found and the price is very appealing. Not too much lends itself to quantity here, but one-off or unique items abound. It is as much a discovery time as it is a bargain time. Most of the stuff is newish. That means it is new but manhandled quite a bit. Customers pull an items out for inspection and then toss it any where that is convenient. Then, a clerk follows them and folds or hangs the item up for the next treasure seeker. It is almost comical. This time it was a unique experience. From the time I entered the store my eyes caught a glimpse of something that made me focus. It was a picture. This piece of decoration was located along the back wall. Yes, from the front of the store to the back of the store I locked into something that grabbed my curiosity. Without being rude or in a hurry, I walked toward my target. There was something about that picture that had my imagination. Aesthetically, I liked what I saw. It wasn’t gaudy or overdone. Instead, there was a balance in the picture. Colors were basic and yet highlighted to give it dimension and texture. It wasn’t symmetrical yet, not awkward. The subject of this art piece was a zebra. It wasn’t a photograph. There is probably a name for this kind of art but I am not privy to its identification. Simply, I just liked the picture. It was large, perhaps nearly four feet tall and three feet wide. No frame was needed, just the canvas wrapped around a simple interior wood frame. Zebra stripes wove up and down and graduated back to the hindquarters. That horse like face was only partially in the foreground. But, one eye made a connection with any who would glance in its direction. Carefully, I lifted it out of its bin and set it on a shelf so that I could admire it. I was tempted to consider buying it but we have no wall space for it. There wasn’t any extra coins to spend on decorations when so much else on our necessity list preceded it for attention. But, my trusty cellphone camera would have to be satisfying for the moment. Isn’t it a cool picture? 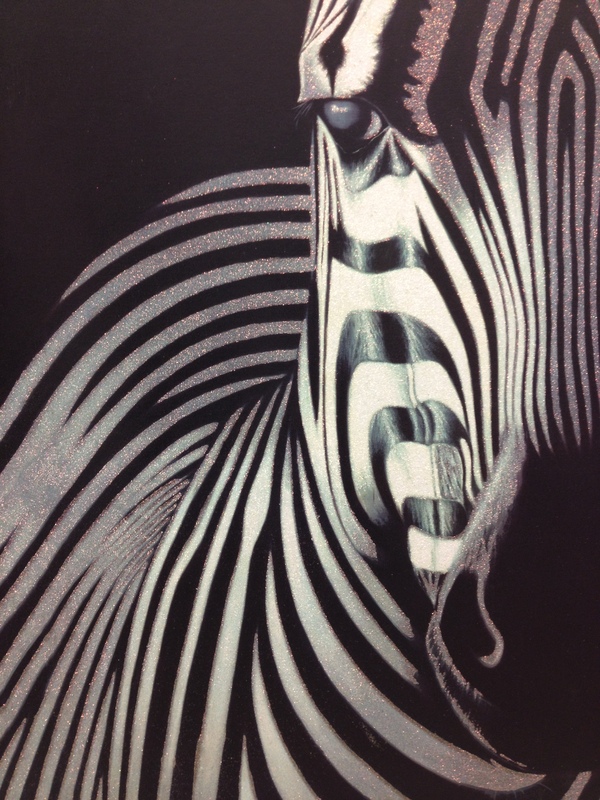 Very cool zebra. Life in Texas is wonderful. 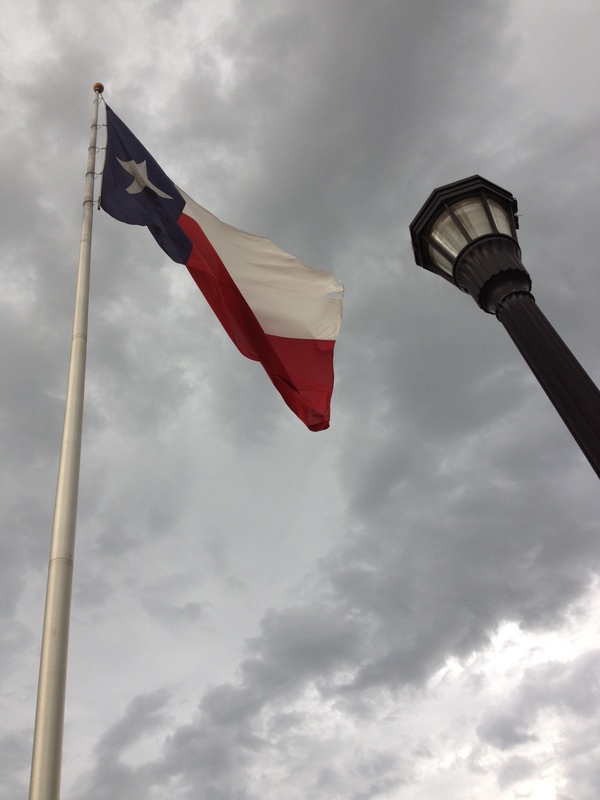 The first phenomenon for a Texas newbie are the people. They are warm, inviting and friendly. The second phenomenon in Texas that transplants notice are the people. That reputation of Southern hospitality is fact not fiction. You find yourself talking, laughing and sharing information before you even know each other’s names. Third on the noticeable differences by those who are new to the South are the people. Yes, I know that I’m being redundant, but it is true. Invitations to get to know you are free-flowing. Where did this amazing sense of interaction find its genesis? I am floored. Even when we were staying in a motel during our transition, we were laughing with a family in the elevator like we were long time friends on a road trip together. It was amazing. So far even the driving in this newly adopted state of ours has been similar. Only two drivers have honked at me in nearly a month. That’s the average number per hour in other states where I have driven. On a busy freeway when I engage my turn indicator, other drivers actually slow down and give me clearance to merge. I’m so used to allowing a couple of miles to change lanes that I am shocked when room suddenly appears. This courtesy on the road will take some getting used to. I thought that the hot weather would breed road rage. In my mind I was prepared for the wide open spaces of Texas to multiply wild drivers. There are some as in any big city, but the prevailing number of pleasant drivers was not what I expected. It is a nice surprise. Then, came a southern surprise that made me chuckle, “Why bless your heart, Darlin’. Let me fix you right up.” She led me to two chairs around the corner. There I promptly fell asleep. Since, then waitresses, gas station checkers and receptionists all share a delightful repertoire of greetings: “Sweetheart” “Honey” and “Precious” seem to be the favorites. Each time I smile, chuckle and smile. There is something about being in Texas that is just part of the daily fun. My whole anthropology may be taking a noticeable adjustment. It’s all about the people, Texans. Y’all hear? Houston has been our home for a month. The adventure of a new place is slowly transforming into a routine. We are finding the places that we want to go and the best route to get there. Now, it’s time to feel at home, not just be familiar with our new surroundings. That means discovering comfort food. One person’s comfort food is an exotic adventure to another. For my bride and I there is always time to explore for authentic Cantonese cuisine. That is the food that we remember from our days as children. It is the food the is the center of our family celebrations. Our moms cooked these dishes for us. When the family came together to feast on these common dishes, we felt a part of something that made us feel safe, significant and important. Comfort food does that to you. It links palate with memories, meaning with aroma and love through that language of taste that is never easy to put into the words. But, when our olfactory nerves register a familiar dish, then we salivate and a lot of problems dissolve and life finds its balance again. We found a Cantonese restaurant not far from our home. The owner stopped to talk to us. She suggested that we order from the Chinese menu. She gave us each a copy and we talked through the dishes. We chose a beef stew dish. 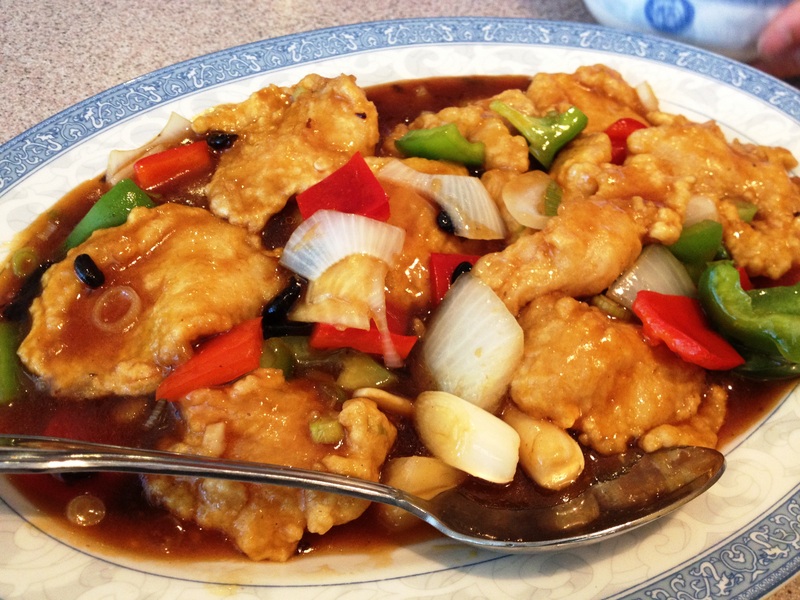 To that we also ordered a fish dish in black bean sauce. When the food was served, it was delicious. More so it was very familiar. Emotionally, it was like a little bit of home which is far away, has been transferred to our new land. 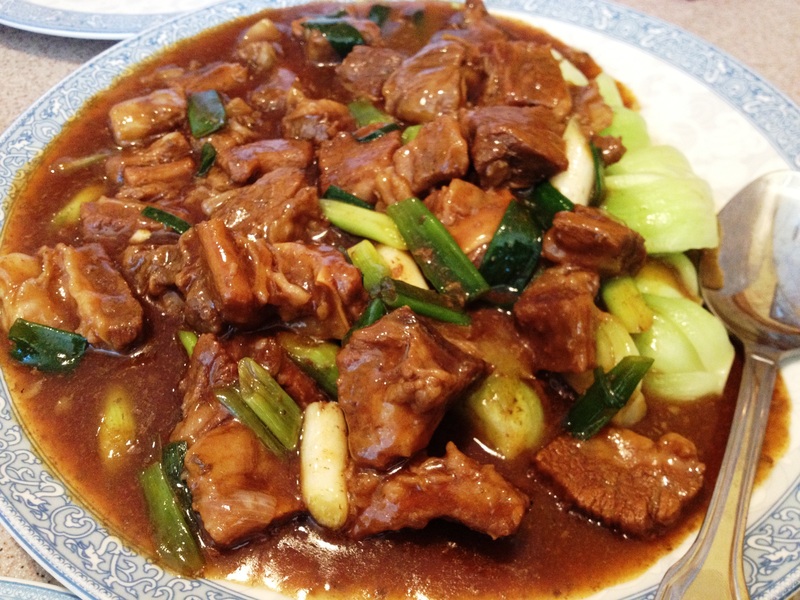 If you are a fan of Cantonese style food and find yourself in Katy, Texas you should stop in and give Mary’s restaurant a try. It is named China Cottage and it is located on S. Mason. The wait staff is amazingly friendly on top of everything else. Can you concentrate and tie a lot of fragments together when they are thrown at you in rapid succession? Are you able to recall story lines from the past, conjure them up swiftly and connect them to the exploding story on the silver screen? Don’t ask questions, just process and pick up your pace. 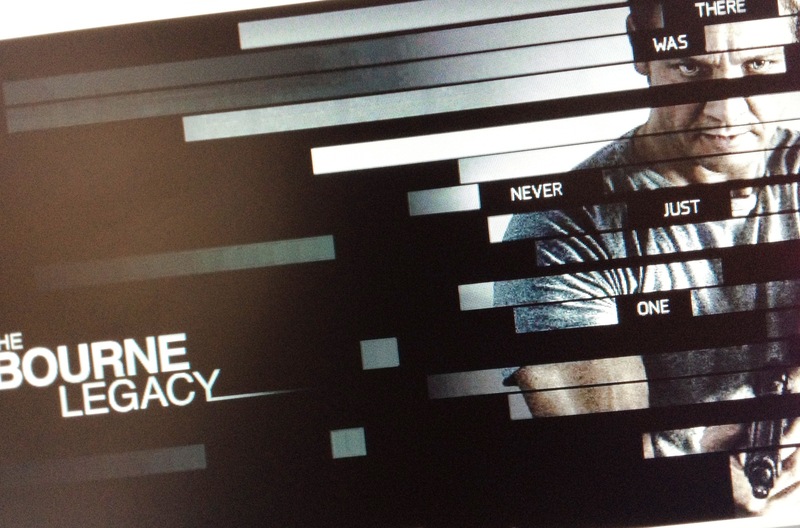 Jason Bourne was just a glimpse into the seedy side of the Feds. They have secrets from each other, pouring resources and manipulating people’s lives for their own projects. Black ops is a kind name for their despicable deeds. Number 5 is in perpetual training to do the dirty work for power-mad bureaucrats. When there is a threat to their culpability, they pull the plug on their misdeeds and hide the evidence at all costs. That cost is high with a price tag of human lives, American lives. The best of the deviants can’t control all circumstances. #5 escapes through uncanny ingenuity and the life of a natural predator dies so that our hero can live, at least for a little longer. Enough blood and guts cry for a rescue and she comes. Circumstances drive this agent and the life of his examining doctor into a path of flight and desperation. Matching training and wits against a massive machine, this elusive pair escapes around the world in order to find a medical relief in Manila. They are discovered, chased down and surrounded. Layer on top of the crazy medically enhanced assassins is the LARX program. The bad guys activate LARX #3. He enters Manila on the run to execute the two heroes. The chase is on. Running, driving, hopping on roof tops there is a collision course that leaves a myriad of local police in the wake of professional killers. Hold on to your seats because the pursuit is just warming up. Right when you think that there is nothing new to add to high-speed running around a motorcycle scene takes over. It is amazing to watch this action sequence. Real riders will appreciate the intricacies and stunts. There are plenty of moments for “Whoa’s” “Sick” and “Yah’s!” during this lightning fast episode. Tight turns and crazy hurdles amaze the mind. This is just plain action packed excitement. Dr. Shearing is amazing. Bright and innocent, she fights out of her trauma. Threats demand that she fight back and she does fabulously from the pinion.